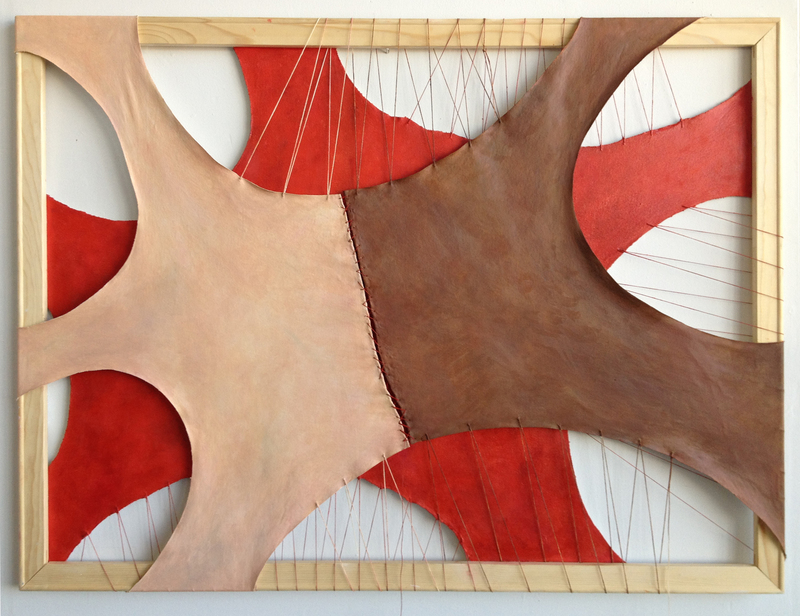 Here is the latest work on the new sculpted/stretched painting. The step you didn’t see here was where I worked on the back (blue/purple) layer and stitched up the middle (redish) layer. While I am dedicated to exposing process a little bit of mystery is in order from time to time. Here you are seeing the freshly gessoed top layer I just attached with a temporary protective layer hiding the rest of the piece. The gesso is lightly tinted to be similar to the under-skin color of the skin shade I will use (based on my own this time). I will be painting the final layer in oil tomorrow, barring catastrophe and then I will go over the whole piece, bringing the layers together as a whole. 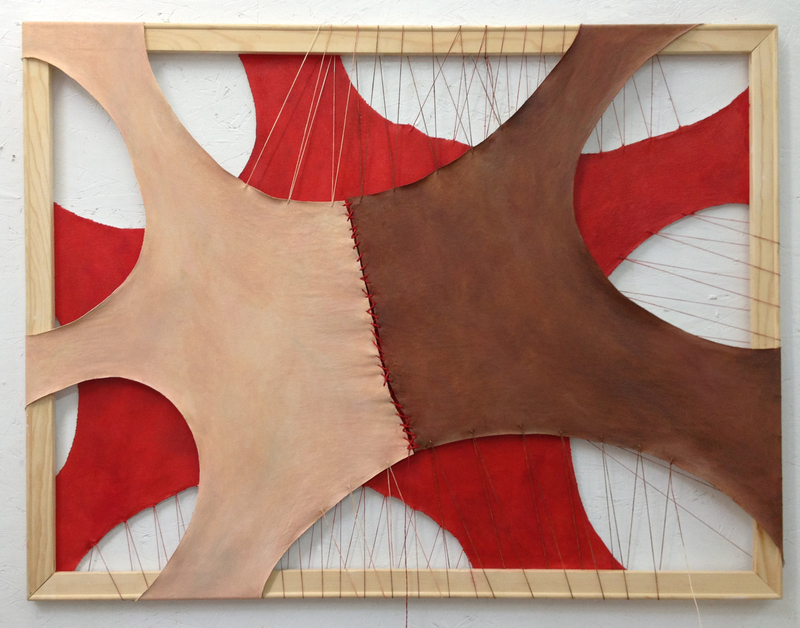 I’m really loving this body of work- loving the sculptural and fiber elements. They have meanings for me as to body and apart from body but I prefer to let the viewer approach them on their own terms rather than explain each one in detail. I started out with several strategies in mind for how on earth I would get the look I wanted. Last post I was debating doing a plaster positive. I ended up doing it as a backup, though it was too wet to use that day. It turns out it’s a good thing I did because it was essential today! Sculpturally the easiest material to use for get the effect I wanted would have been paper- I could simply create a large Venetian-technique mask over the stretcher bars. But for me it had to be canvas. I love subverting the traditional medium of oil-on-canvas to make it do new and interesting things. 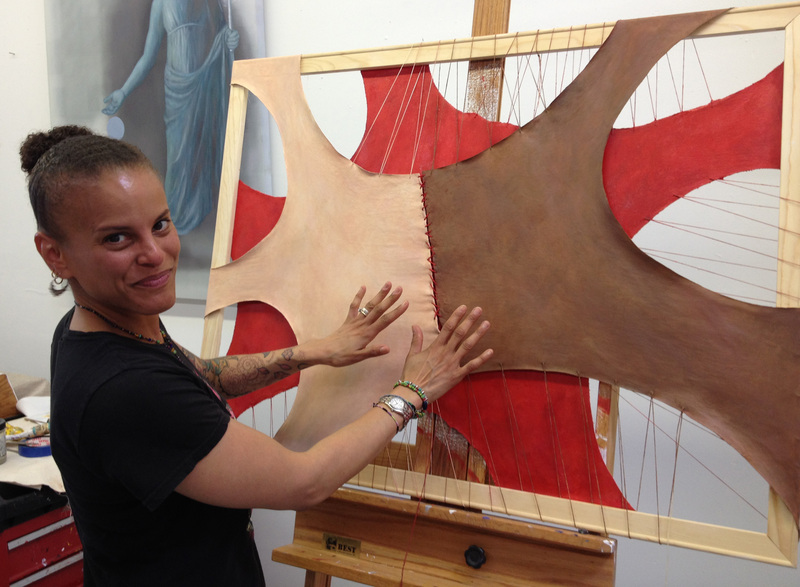 I love it when people look at my sculpted canvases or skin painting and assume it must be other materials. 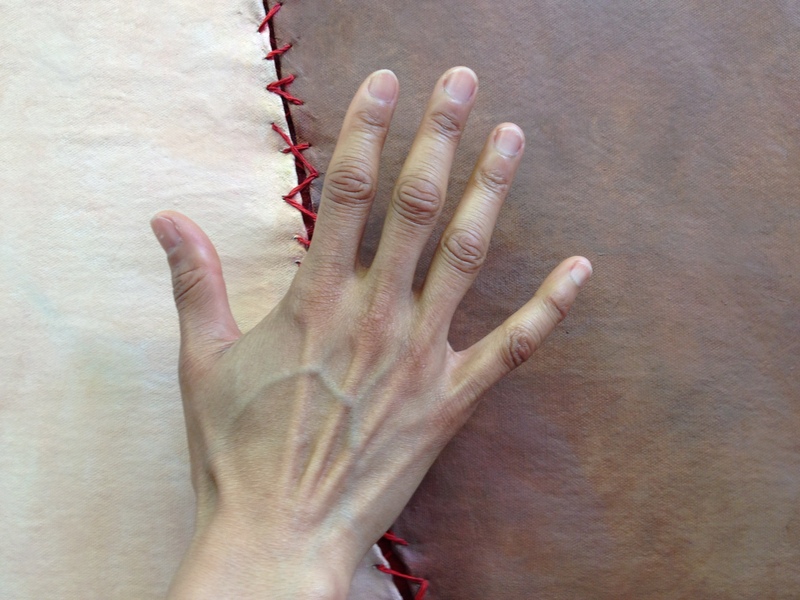 I love the idea of canvas becoming skin too- a surface face we show the world. I seem to like making things difficult. The clothespin on the nose cracked me up. It worked though! I was amazed to find one in the studio. So… it must be canvas. In the end I did hours of elaborate propping, stretching, cutting, sewing, picking out stitches, weighing down, pinching etc. 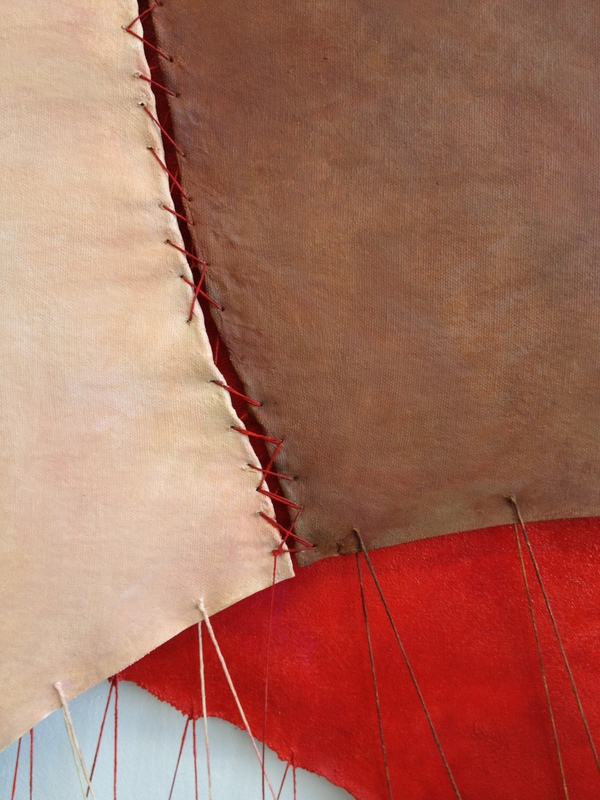 I was having a rotten time of it until I remembered to think about canvas as fabric again with more of a seamstress brain on. It needed to have some folds in the flat parts to make up volume for the raised mask part. Interestingly that’s how I first sketched it. 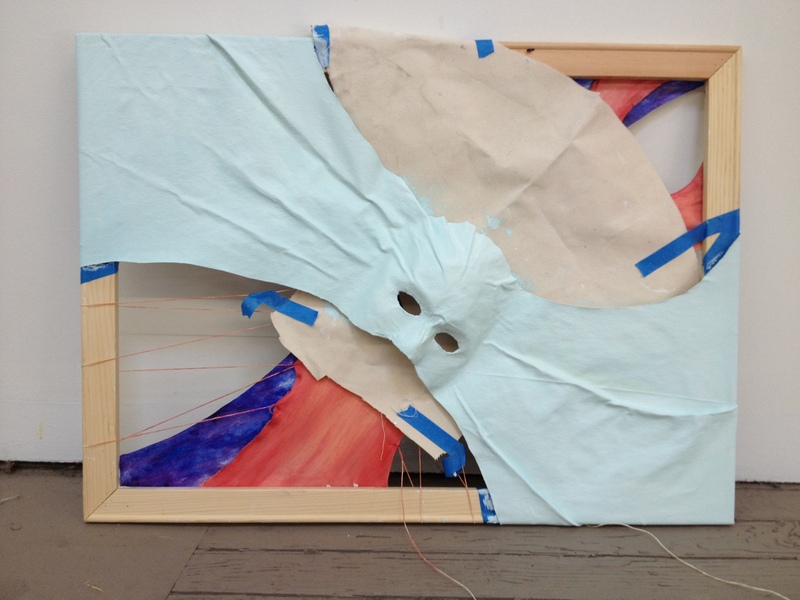 Once I had that it was still a struggle to get the canvas to behave, but I got it there. I did this time mix a small amount of plaster into my gesso, but that’s still not outside of classical painting anymore than wax is. I had to run from the studio before I poked at it in some fatal way. 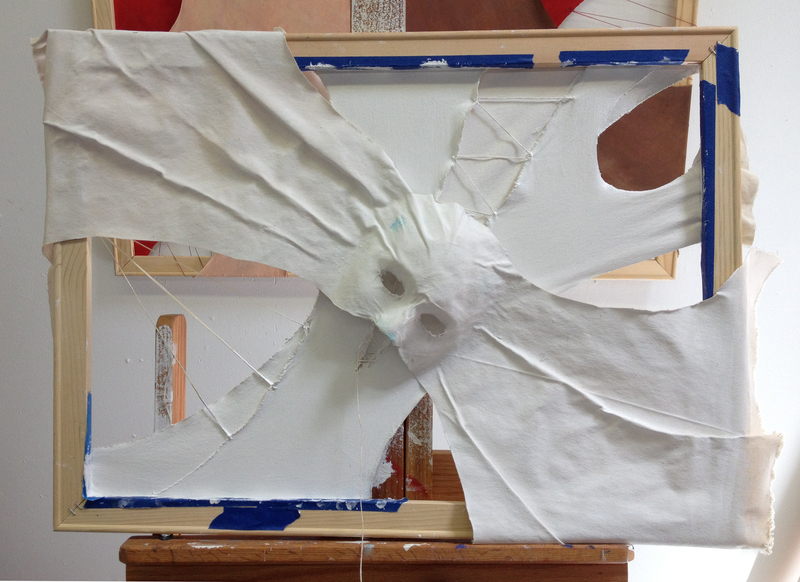 The edges and eye-holes will be re-cut, and after I reinforce the back of the mask I will be working the rest of the canvas a bit to stretch it into the frame. I will need to remove the whole thing, re-work it, do the back painting and then stretch this one in front. I ended up changing the diagonal at the last minute. I like the idea of the background painting soaring up and to the right while the mask looks down a bit. That was another tricky piece of this. I did not want the mask dead-on. It had to be turning slightly to the side. Dead-on would have been easier, but more static and a bit more trite. This one will have more intensity. My art happens in many places: the studio, the cafe, the museum (including history and science museums), the wander, the train, the kitchen, the sewing area, the back yard, the industrial workspace, the standing desk, wherever I am watching my daughter and even the couch. This is where I get my work done, and in about that order. Today work is happening in the kitchen. I’m going to use techniques I learned from a mask-maker in Venice a few years back to add a three-dimensional quality to my next stretched skin painting. I’m using a copy of the wax positive I used for casting the glass part of “She reveals hidden color“. 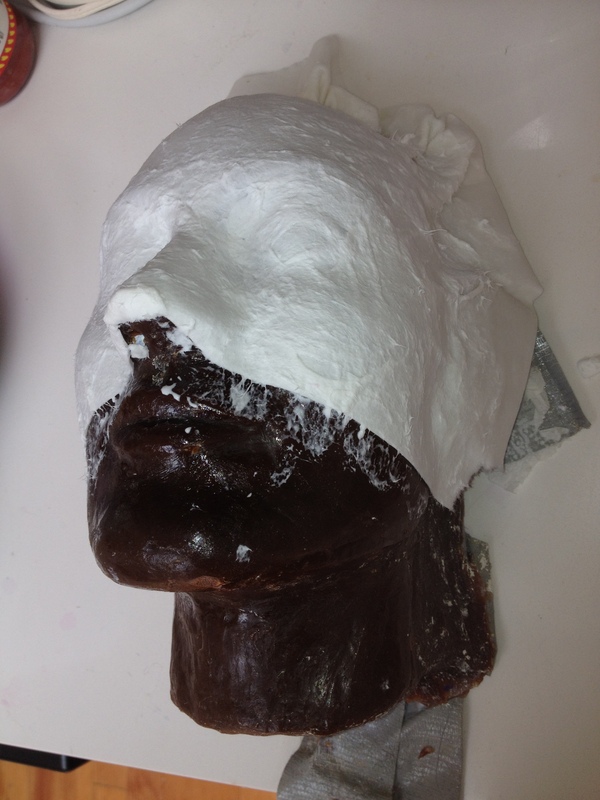 I never trust kilns- anything can go wrong and frequently does, so I made a copy of the face I sculpted in wax before I added the mask and put it the wax positive in plaster for the glass kiln. This means I have a life-sized wax head kicking around. 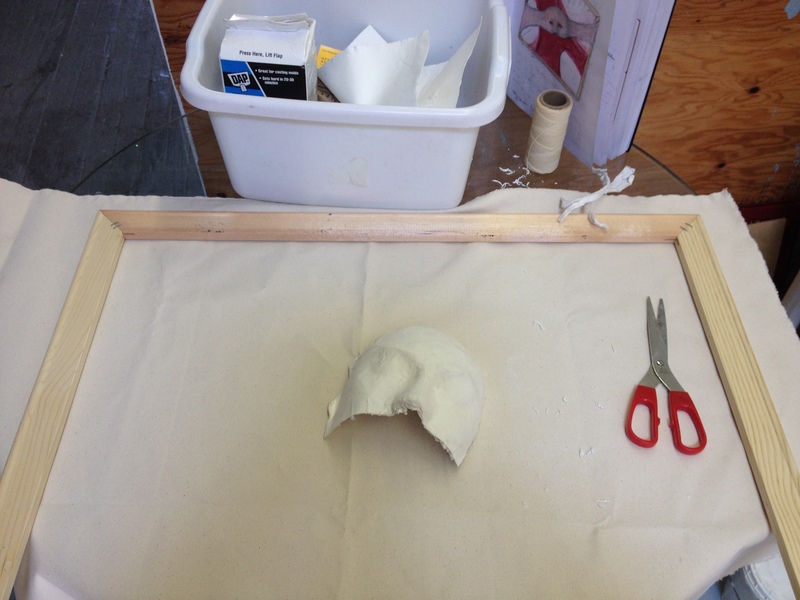 The way I would do this ideally would be to make another alginate mold (the squishy stuff they use in the dentist’s office to take impressions of your teeth) of the wax positive and then make a plaster positive from that, then do what I’m doing right now on the plaster one. 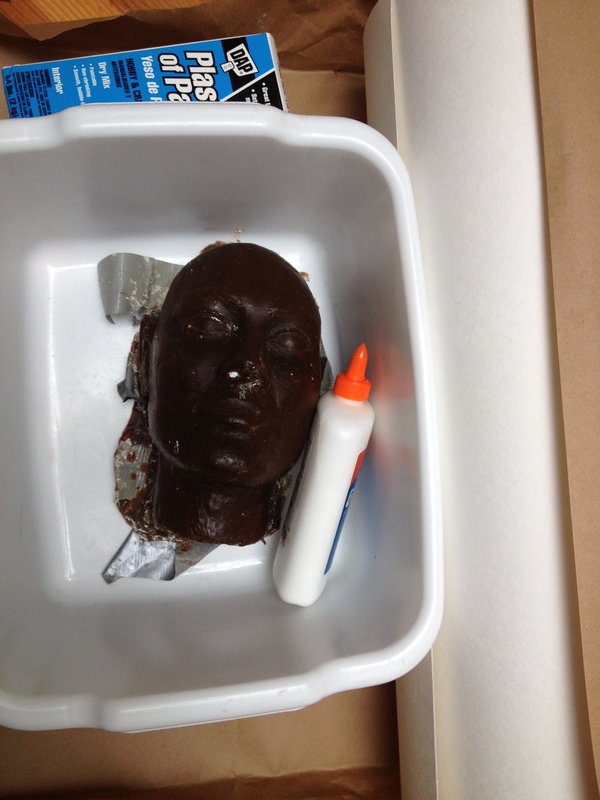 It will save me half a day and a lot of alginate to do it just on the wax… if it works. 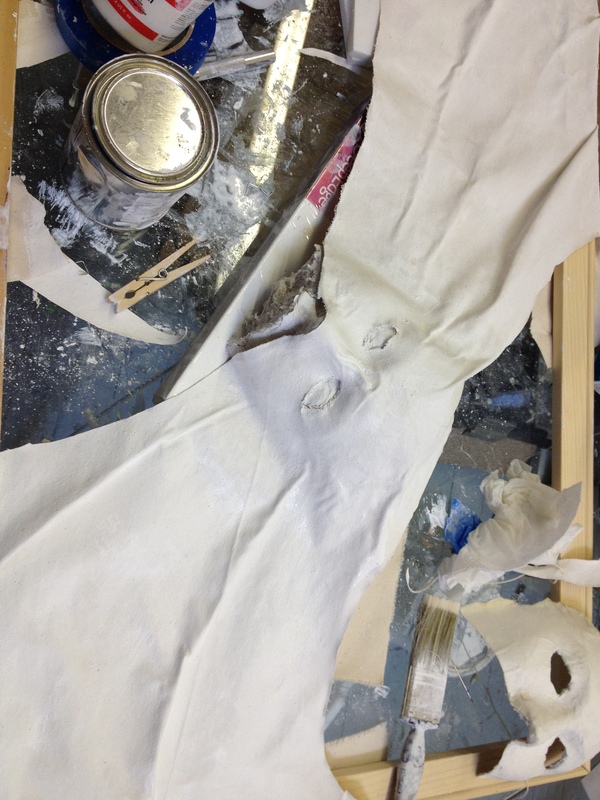 I just molded a wet layer of blotting paper to the wax face and applied a layer of glue on top of that. I will use several such layers, some with plaster mixed in. 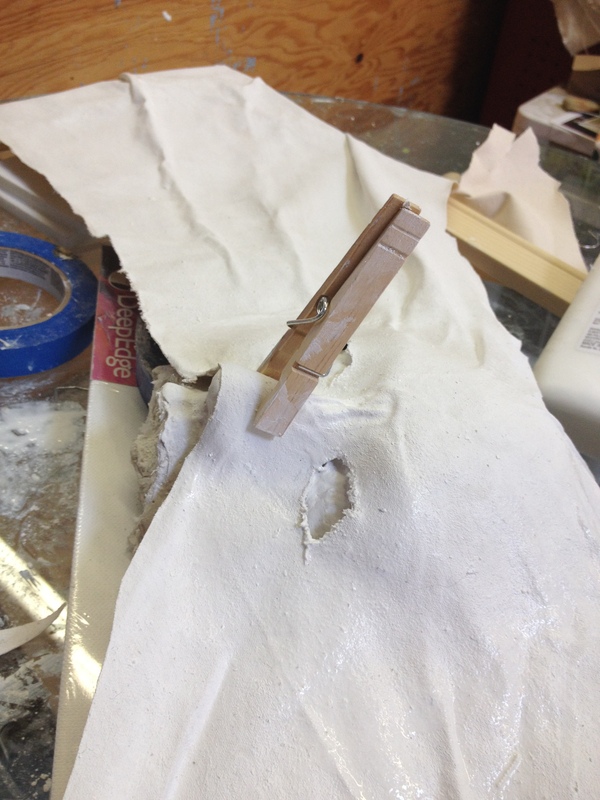 The reason to use a plaster positive is that plaster absorbs moisture and the paper would dry more quickly. I’ll give it an hour while I work on things for Identity Tapestry. If this first layer hasn’t begun to dry I’ll make a plaster one. So… art in the kitchen. It has the added benefit of being able to make tea at the same time. So… now over to making new laser-cutting test files for improving the plaques on Identity Tapestry. Obviously I believe in using any materials at hand to make the work as I see it in my mind, from centuries-old craft techniques, to traditional fine-art mediums, to lasers. As of yesterday “Deborah’s Story” is finished. I was right- it did need just a little more intensity in the red stitching. Today I set out with my friend Debbie (whose story inspired the painting) to the DeYoung museum’s Gautier exhibit. It was wonderful to see the show, as fashion is an interest of mine, but all the better for the excellent company. It was great to be able to talk over ideas of identity, gender, race, identity politics etc. (not to mention fashion, art vs. craft, etc). with her. It was also great to sketch out an ideas for coming projects with her input and ear. Talking through ideas with other people is such an important part of my process and I have been spending far too little time doing it lately. Debbie is excellent museum company. I find it very hard to go to exhibits with most people. Either they breeze through or there is an obligation to stick together for the entire thing. This is the second time we’ve been to a show together and it’s effortless. We leapfrog through. I stop to sketch, she looks at what she likes to, we come together and discuss, part and look at different things… but still largely at a similar pace. She’s similar enough to me that we completely connect at a deeper level and don’t need to explain very much to each other at that level, but we are also different enough to have very different experiences and perspectives on things. She’s awesome. Better still I took her to the studio afterwards to see the painting she inspired. She told me the story some four years ago, but I thought of the piece fairly recently. I finished it yesterday and I’m pleased. I was thrilled that she liked it so much and got so much out of it. She had associations with it that had not even occurred to me but which fit beautifully. The halves did fit the coloring of her mother and father as I hoped they would. I loved seeing her hand across the two sides. It so clearly fit. She was also able to see the more subtle layers of color and transparency in person that just don’t translate on the screen. I think I may try to do a version of that shot properly sometime with a serious camera and better lighting. Done right it’s another piece by itself. I also discovered that when she is tan she is the perfect shade to model coloring on the Pieta piece! Yes! This means I can start back up on that when she gets back from Paris and I finish this iteration of Identity Tapestry for the LA show. I had a wonderful day. Museums and conversations feed my brain and I got that. I’m also over the moon that everything between her and this piece was so good. It meant a lot to me that she be happy with it. Her only request was that I use her birth name for the title rather than the shortened nickname-version, and so I have. I love having other people become willing parts of and participants in my work- their thoughts, experiences… even parts of their physicality. It’s wonderful. I’m thinking I may want to consider re-stitching the center. I may want a little more visual impact at a distance, a little more obvious red. We’ll see. I usually like to let a new piece sit when I think it might be done. Sometimes it asks for more when I next look at it, sometimes it doesn’t. You need to distinguish the voice that tells you to overwork and pick at a piece from the one that genuinely asks for something more. If you overwork a piece you tend to kill it. You can of course push through even that and re-create after the destruction, but that usually creates another piece entirely. When you feel that tendency, it’s time to take a walk out of the studio and possibly face the painting to the wall until you have fresh eyes. Sometimes it’s just best to go home.I always try to have at least two pieces in progress in the studio so that if I’m stuck on one for whatever reason I can work on the other. Otherwise I might avoid the studio altogether and that would be a mistake. There is also that urge to poke at work when you ship it to a show or collector. I don’t let myself really look at work when I’m preparing to send it. It makes it harder to let go of and it makes me want to rework it. It’s funny- you get these relationships with pieces. You adore them and want to see them every day, you resent them at times, argue with them, revel in them, worry for their safety when they are sent away… sometimes they are like a child, sometimes a lover, sometimes a comfortable old friend and sometimes someone you love but don’t like very much at the moment. It’s all there. All of that said, I have a feeling this one needs the red stitching to be 3 times as thick.